Bekir S. Yilbas received his PhD in Mechanical Engineering from the Birmingham University. He was awarded the Doctor of Engineering in 2005 by Birmingham University owing to his significant contribution to his field of study. He has published over 600 journal papers in reputable international journals and presented over 100 papers at international conferences. He has served as an editorial board member of international journals, including International Journal of Machine Tool and Manufacture Design, Research and Application, International Journal of Subsurface Sensing Technologies and Applications, Journal of Materials Processing Technology, Journal of Achievements in Materials and Manufacturing Engineering, International Journal of Nano-manufacturing and Archives of Materials Science and Engineering. He has received numerous awards as recognition of his research work. Dr. Haider Ali received his Ph.D. from King Fahd University of Petroleum and Minerals, where he is now serving as a Post Doctorate Fellow. 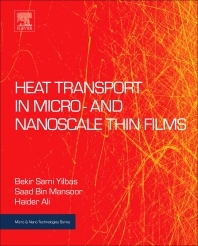 He is co-author of the book, Heat Transport in Micro and Nanoscale Thin Films.